With multi-sockets, label the plugs on your machines and power tools so that when, for example, you unplug the router to change a cutter, you pull the right plug. Here are three plugs in a multi-socket. 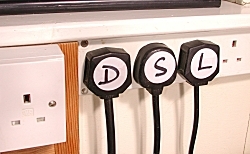 ‘D’, ‘S’ and ‘L’ denote ‘drill’, ‘saw’ and ‘lathe’.